As your audience will vary from supervisors to examiners to other researchers, writing up your thesis requires special attention to structure, writing style, formatting, and academic integrity. Email the Graduate Research School Office if you have questions about how these regulations and guidelines may affect you. Formatting your thesis requires detailed attention so read the Library's practical guidelines in the Formatting your thesis box. An Otago thesis writing template does not exist. Department requirements vary so consult your supervisor or recent departmental theses. In addition, the Library recommends that you keep all other margins uniform and at least 20mm, including for any appendices, tables and figures, photographs, or other illustrations you might include in your thesis. Following these recommendations will ensure that your entire text and page numbers remain intact when you thesis is trimmed during the binding process. Use word processing software such as Word, Open Office, or Pages. See the IT support tab for more details. Specific title page layout, heading and citation styles may differ within Departments. Please consult your supervisor. Chapters - keep as separate document files during writing, to retain formatting. Once the thesis is complete merge these files into a new document. Versions of files and regular back-ups of all documents - keep to avoid loss of vital work. LaTeX is a programme for formatting scientific and technical documents. It is sometimes used by departments such as Computer Science, Information Science, Physical Geography, Mathematics and Physiology. manage your files, so that they can be easily located and identified, by yourself and others. Save time and checking by collecting all the necessary data for each reference, at the time of consulting the works concerned. Managing your references - guide to recommended software for in-text and bibliography tasks. Seek assistance from your Subject Librarian and ITS staff. Robertson Library LB2386 .P67 2014; and at Hocken. See Pt 2 on writing and publishing. Some disciplines have specific style manuals on writing, and citing. Check their details on layout, structure, writing style and formatting. Also check with your supervisor. University of Otago Regulations and Library guidelines are in other tabs in this box. Some disciplines have specific style manuals on writing, and citing. Check the details on layout, structure, writing style and formatting. Always check with your supervisor. leave one-and-a-half spacing between lines. The Library recommends that you consecutively number your pages, as well any additional sheets, tables, maps, and/or appendices you might include. Center your page numbers at the top or bottom of the page, or keep them flush with the outer text margin, making sure that you keep them within the binding margins. Number preliminary pages (i.e. contents, acknowledgements etc.) using lower case Roman numerals, and main text using Arabic numerals. Clearly identify the location of any figures you inset in the text, e.g. facing p. 42 or between pp. 42 and 43. Use numerals for percentages, decimals, street numbers, page numbers and dates, and in technical or statistical discussions where groups of figures are used. Numerals at the beginning of a sentence are spelt out. See the Templates tab for details. * Turabian, K. L. et al. (2013). A manual for writers of research papers, theses, and dissertations, 8th ed. Chicago: University of Chicago Press. An abstract of no more than 500 words is required – see Examination and Assessment Regulations 2014, 14.3e. The abstract should consist of a statement of the problem, an explanation of the method and procedures, and a summary of conclusions. All quotations should correspond exactly with the original in wording, spelling and punctuation. Usually not more than three lines in length, are enclosed in double quotation marks and incorporated into the text. Indented at both margins forming a block that stands out clearly from the text. Single quotation marks are generally used for quotations within a quotation. Enclosed in square brackets, e.g. [sic], to assure the reader that some error has been noted in the original. Use three spaced periods . . . and take care that the original meaning is not altered. so check with your supervisor in case your discipline has a preferred style. These may include photographs, maps, graphs, charts, diagrams and musical examples. Placing and numbering of figures is the same as that for tables (see below), except that the word Figure, its appropriate number and caption should appear below the figure. Musical examples are the exception, placed above the example. Referencing styles will vary on use of Figure in text, or fig. used parenthetically in text, e.g. (see fig. 3). Number tables and figures consecutively throughout the text, or per chapter, and write their titles without terminal punctuation. Number photographs, maps and graphs in Arabic numerals. Text references are made in brackets and should precede the figure unless mentioned as part of a sentence. If not the author’s own work, acknowledge the source and clear copyright. Numbered consecutively using Arabic numerals. The heading ‘Table’ and its number and caption title should appear above the table, leaving the remainder of the page for source citation or explanatory notes. If the table occupies a full page, the caption may be typed on the reverse side of the preceding page, facing the table to which it refers. To cite the authority for statements in the text. To explain or supplement material that is included in the text. Use the Insert Footnote function in your word processing software to get consistency. After the first footnote reference, in full, use short form for subsequent references, i.e. author, short title, page number/s. Reference management software will assist with this, or do this manually. Ibid. (ibidem = in the same) is used for a consecutive reference to the same work, but not necessarily to the same page. If ibid. is used without a page number, the reference is to exactly the same page as that previously cited. Ibid. should not be used more than two pages after the original citation. placed in a pocket inside the cover. In-text citation styles vary by discipline - check with your supervisor, and manuals of style, e.g. ACS, APA, Chicago, Harvard, Legal style, MLA, and Vancouver. Insert citations to the literature into the text as the reference is made, instead of using footnotes. Author-date citations consist of the author's surname and the year of publication, enclosed in parentheses. Depending on the sentence structure where the citation is made, parentheses may enclose either the name, or the date, or both. Page numbers may be included. Full citations for these in-text sources should be listed alphabetically by author, in the “Bibliography” section of the thesis. Insert a number in superscript or parentheses, in the text at the point of citation. The citations appear in a numbered list of references at the end of the work. Vancouver, often used in the Biomedical Sciences, is an example of a "numbered" style and follows rules established by the International Committee of Medical Journal Editors. Check examples of Vancouver style. For theses in the humanities it is usual to choose a heading such as “Selected Bibliography”, “Works Consulted” or “Reference List”. Include all sources which have substantially affected the form or content of your thesis. For a “Works Cited” list only include materials referred to in-text. For a lengthy bibliography, as in a history thesis, the references can be arranged according to type of material, e.g. primary sources (manuscripts, official publications, newspapers) and secondary sources (books, periodical articles, theses). In science theses full citations for each source mentioned in-text are listed in a bibliography usually called “References”. If the Arranged references alphabetically by author’s surname and under each name by year of publication, in the Author-Date system. In the Reference-Number system arrange sources by authors’ names or in the order that the references are cited in the text. An appendix is not always required. It provides a place for material that is not absolutely necessary to the text, or where inclusion in the text might break the flow of argument, e.g. the full text of an Act of Parliament; a timeline of key events; a questionnaire. Appendices may be sub-divided according to the class of materials include, so list each appendix by capital letter and title in the Table of Contents. Academic integrity - University of Otago has a strict policy surrounding original research. 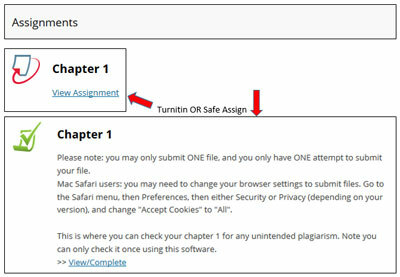 Graduate Research School has set up Blackboard papers for PhD and Masters students where you can use Turnitin or Safe Assign to check your thesis chapters for matching and ethical referencing of sources.